I had finally port Bazaraa CFW v IV to C6 RM-612 & N97 mini RM-612 which considered the best for both phones till now, I have successfully port it without having the phones and they works without bugs. The CFW has been based on the latest version for both phones means v 42.0.004 for C6 and v 30.0.004 for N97 mini..
At the beginning install "JAFSetup_1.98.62" then install "JAF_files_update" and accept replacement, thus we have installed JAF correctly. 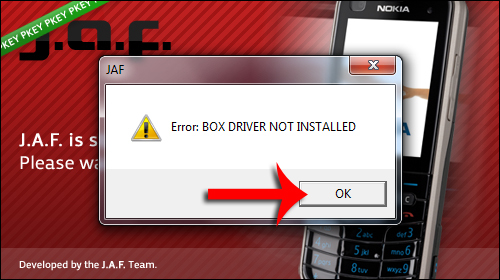 STEP2: After that open the same file "OGM_JAF_PKEY_Emulator_v 5" and press GO this message will appear ..
STEP3: Don't consider it error but press OK and the JAF will run correctly. Now we must move folder "RM-612" (or "RM-555" according to your phone) to "C:\Program Files\Nokia\Phoenix\Products" after deleting all files from it,and if we don't find that path we must create it manually. Note: CNT button will not be active and that's normal, so go on and continue flashing..
DOWNLOAD LINK: "NEW LINKS: 24-01-2013"